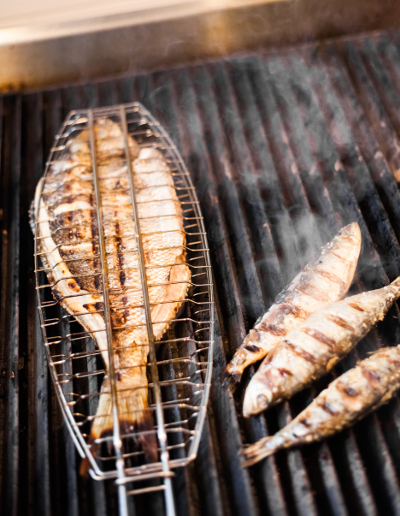 If you like aniseed then this barbecue sea bass recipe is for you. Not only does it have lots of fennel seeds but it gets a final flambé with Pastis when ready for serving which adds flavour and of course makes for an impressive presentation. Sea Bass (also known as Grouper) is a round fish similar to salmon in shape which can weigh up to 10lbs (4.5Kg). It has steel grey or blue scales covering the back and sides and a white or yellowish belly. You can easily identify a sea bass by the dorsal fin which consists of two parts; a forward, spiny section and a hinder, soft-rayed section. The two parts of the fin are more usually joined but can be slightly separated. I've gone for a medium sized fish which is ideal for grilling. The really large fish don't grill so well so if cooking for more than two people, get a second fish rather than going for one large one. TIP - If you don’t have Pastis to hand, you can get away with Pernod, Ricard, Ouzo or Raki to name a few other aniseed aperitifs. (To be honest I think that they all taste pretty much the same if you ask me). 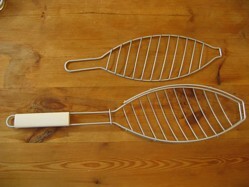 TIP - A oil brushed fish basket will help you turn out your barbecue sea bass with confidence and keep the fish in one piece for perfect presentation. Other than the fish there are no allergens in the ingredients list. Make 4 or 5 incisions on the diagonal across the sea bass and drop the fennel seeds into these incisions. Season with salt and pepper, place it in an oiled fish basket and grill for approximately 20 minutes turning it once at half time. Marinate the thinly sliced fennel bulbs briefly in the olive oil to ensure they are fully coated and then place them on the barbecue grill for about 6 – 8 minutes taking care not to burn them. Turn the fennel occasionally, you're looking for it to soften and scorch the outside but not to burn to a crisp. When everything is cooked, plate it out on a serving plate with the fish as center of attention and the grilled fennel around the periphery. Pour the Pastis into a shallow frying pan over the heat, set alight to it and pour the flaming Pastis over the sea bass. Serve immediately.